The William Wallace Claymore “As long as but a hundred of us remain alive, never will we on any conditions be brought under English rule. It is in truth not for glory, nor riches, nor honours that we are fighting, but for freedom – for that alone, which no honest man gives up but with life itself.’” Excerpt from the Declaration of Arbroath, 1320 AD The history of Scotland has no shortage of conflict. A country with a beautiful landscape and rich culture, it has also been a land of strife. Whether fighting with the neighboring English or just warring among the clans, Scotland was an ideal place for great warriors to be born – and out of those warriors came heroes. One such hero was William Wallace. The historical William Wallace, while generally known to the Scottish population, was up until recently not well known outside of the United Kingdom. Wallace was a member of an upper-class family in Scotland in the late 13th, early 14th century. His early life is something of a mystery, though it is generally believed he had some military experience, possibly as a mercenary. As there was no clear ruler of Scotland at the time, Edward I of England appointed himself ruler of Scotland in 1296. Responding with characteristic pride the Scots resisted this appointment in small ways until Wallace began a full-fledged rebellion. Beginning with the murder of a local sheriff Wallace and his compatriots won skirmish after skirmish, culminating in a decisive and astonishing (for the English) victory in the Battle of Stirling Bridge against a vastly overwhelming English force. Wallace was one of several nobles who fought against the English, including Robert the Bruce, later Scotland’s beloved king. Wallace was knighted as a Guardian of Scotland, and continued his successful campaign against the English. Edward I sent an army north to deal with Wallace, and eventually defeated him at Falkirk. Wallace then reportedly left abroad to raise support for their rebellion, which caused him to be excluded from the eventual truce signed between England and Scotland. Wallace was captured near Glasgow in 1305 and taken to England to be tried for treason. Famously declaring that he had committed no treason as he had never sworn allegiance to an English king, Wallace was nonetheless executed – his head placed on London Bridge, and his limbs sent to the four corners of the kingdom as a warning against treason. Despite this colourful and action-filled history, William Wallace’s name was relatively unknown to the rest of the world. All of this changed when, in 1995, Actor/Director Mel Gibson launched his epic period film Braveheart. 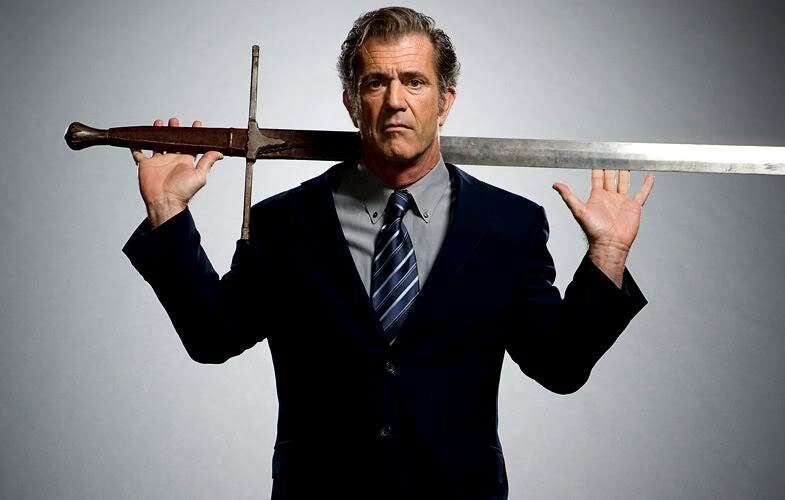 Starring Mel Gibson as William Wallace, the film took significant liberties with the historical facts of Wallace’s life and of that period of Scotland’s history. Wallace now came from a farming family, and had no interest in the rebellion against England until his wife was unjustly killed by an Englishman. Wallace then waged his war of revenge as in history, but has additional “extra-historical” adventures – including the Battle of Stirling Bridge without a physical bridge being present, historically inaccurate blue face paint, and most jarringly an affair with Prince Edward II’s wife, Isabelle of France (who would have been 4 years old at the time). All the while everyone wears kilts that hadn’t been invented yet. The film also portrays Robert the Bruce as a weak-willed coward who betrayed Wallace to the English – unforgivable for a Scottish audience. Despite all this, the movie became an instant classic. Much loved around the world, the people of Scotland had a relationship with Braveheart characterized by its dual nature – hating the film for its inaccuracies while simultaneously loving it for its depiction of Scotland trouncing England in battle repeatedly. One Darksword staff on a trip to Scotland in the early 2000’s was chatting with a local in an Edinburgh pub, the local expounding at length all the problems the film had – but when asked if they’d actually seen the film, the replied, “Oh aye, I’ve seen it six times.” Clearly, a film that caused significant cultural impact. One of the most recognizable features of the Braveheart film is the sword wielded by William Wallace. 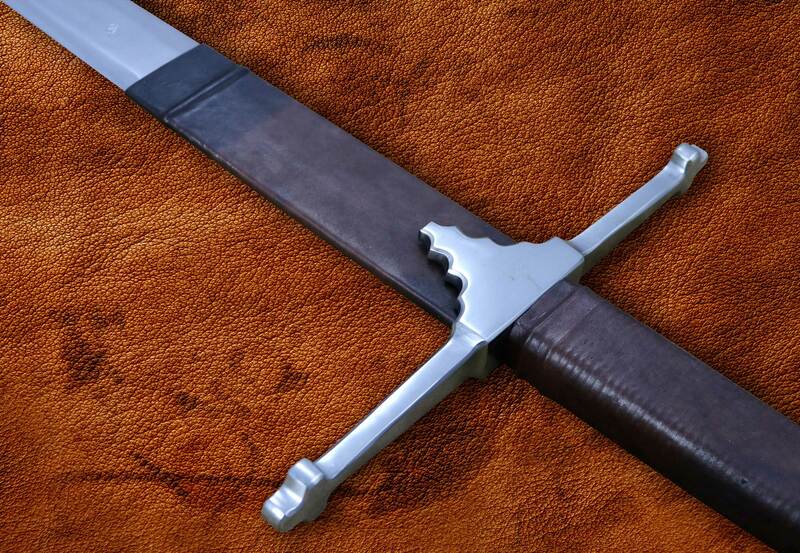 Almost a fantasy version of a Scottish claymore, it is utterly unique among both film swords and historically inspired replicas. 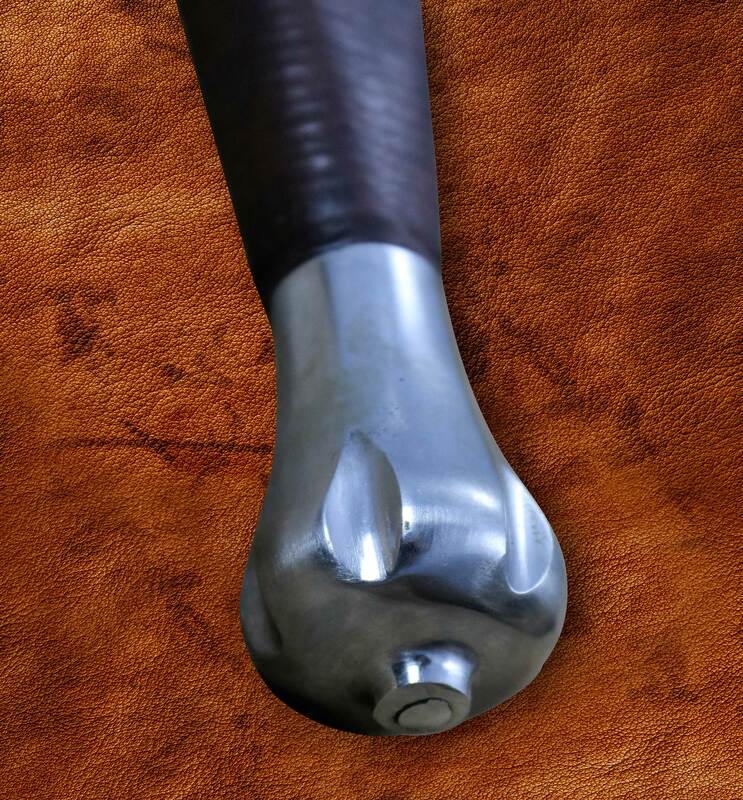 A long, double edge blade is married to a cruciform hilt and long handle for extra torque when swinging, and a traditional Claymore ball pommel completes the fittings – however, it is the ricasso that truly stands out. 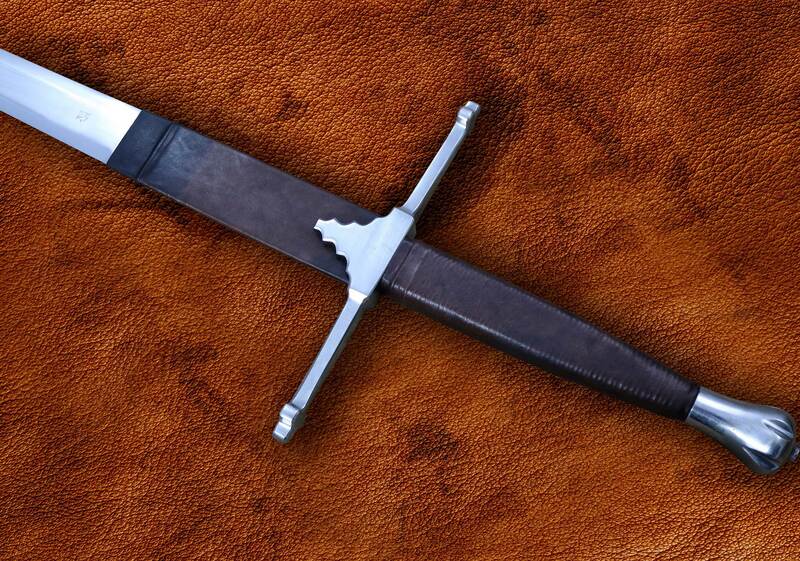 Unlike other swords of this type the William Wallace Claymore has a leather-wrapped ricasso, creating a comfortable place for a fighter to shorten up their grip for close-range work. 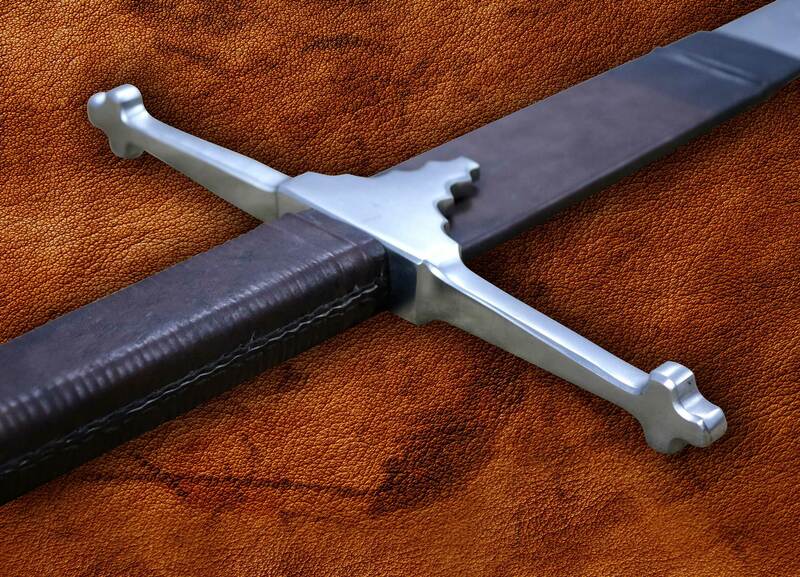 Fans of the film, and fans of Scottish history, can both appreciate the impact that Braveheart has had on popular culture – and this sword was a part of that impact. Like the movie itself, it may not be historical – but it is inspired. It may not have been carried by heroes in the past, but it is representative of the swords they would have carried – an idealized weapon for an idolized character in film history. Hand forged from 5160 High Carbon Steel Differential Hardened at a Rockwell of 60 at the Edge; 48-50 at the core. Wow what a sword. This was my second purchase from darksword. This is an excellent sword and splendid craftsmanship !! Thank you darksword armory. 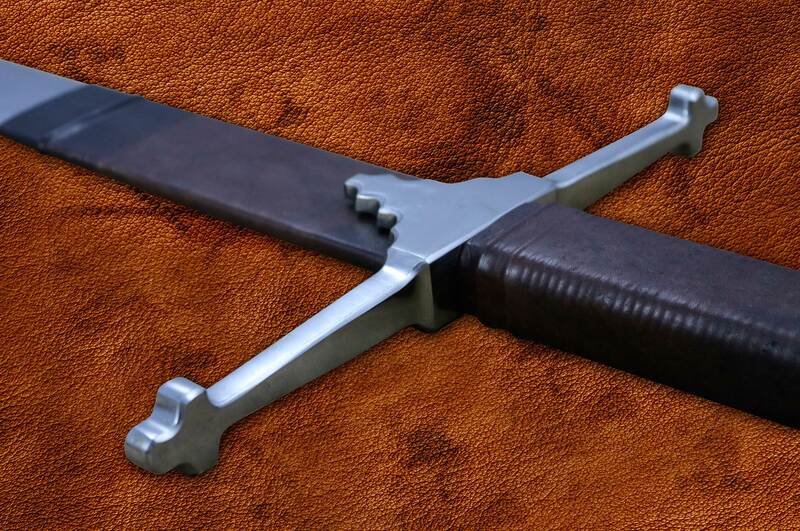 The best looking replica of the claymore used in Braveheart on the market! I really DSA’s rendition of it with the tripple lobed quillons reminiscent of the quatrefoil end quillons of traditional Scottish claymores. I also like that it has a thinner blade with a narrow taper as opposed to many others on the market with a broad blade throughout. The leather wrap over the ricasso of the blade is very tight and secure, with simple but tasteful stitching on the back side. The blade is polished to a beautiful mirror finish and the guard and pommel come with a sort of half-mirrored, half-satin finish which I actually really like on this sword. There is a sizeable and significant gap between the blade and the guard, which seems to be common among DSA’s swords, and is something I would like to see addressed in their future products. It’s not only a visual flaw (in my opinion), but a loose hilt assembly can lead to structural flaws as it does in the case of the sword I received. 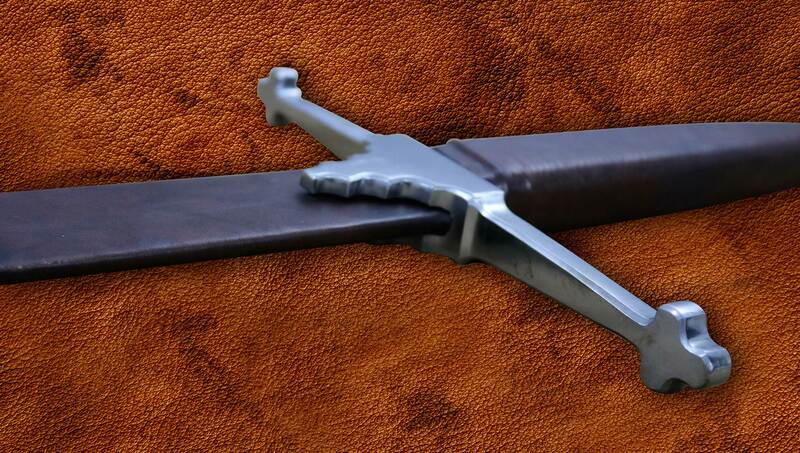 When moving this sword laterally, that is orienting the blade horizontally and moving it up and down, there is a noticeable rattle in the hilt. I believe a tighter and more secure grip assembly would prevent this. This wouldn’t bug me as much for a lower-end sword, but for the price point it is disappointing. Additionally, I ordered the blade sharp and it did not arrive so. It had an edge, but it was certainly not sharp. It could not cut paper, in either a push or draw cut, and it could not cut the pool noodle I tried it on either. After going at it myself it now has a nice keen edge and can cut both (and pumpkins!) with ease. However, due to the aforementioned problems with the grip assemblage, I am hesitant to use this sword too much so as to avoid structural damage.